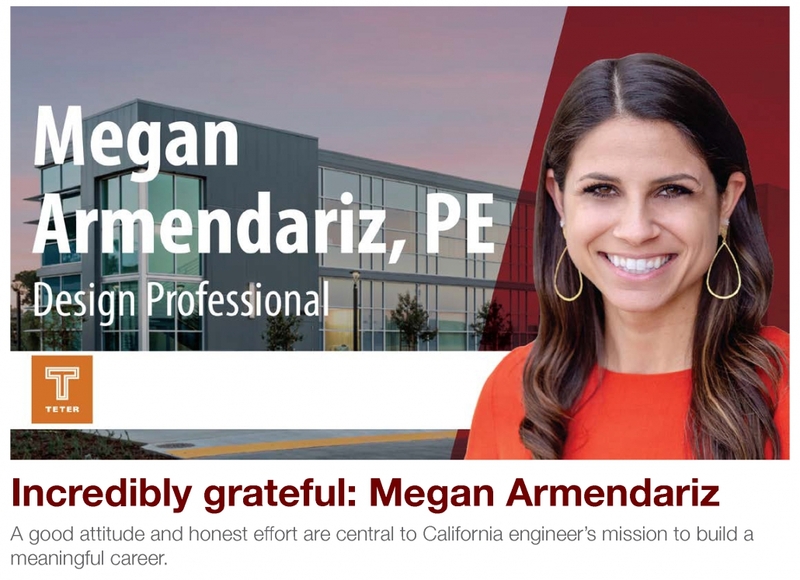 Megan Armendariz is an engineer from Clovis, California. A member of the team at TETER since 2014, the 29-year-old has a master’s in structural engineering from Stanford University. She married her prom date from high school, John Armendariz, who, like her, studied civil engineering at Fresno State. Her favorite movie is Remember the Titans, the last book she read is Everybody, Always by Bob Goff, and if she’s listening to the radio and hears an old Beach Boys song – or even something by a ‘90s boy band – that’s a good thing because it brings back fond childhood memories. If you ask her, she’ll tell you: Her parents gave her the self-belief she needed to be successful. A soccer enthusiast who once considered going to school to become a veterinarian, Armendariz is one of those people who gives back to society. The Zweig Letter: What’s the best advice you can give to an architect or engineer at the beginning of their career? Megan Armendariz: Understand the “why” behind what you are doing. Ask questions to understand the purpose of whatever task you’re given and how it impacts the overall project. Whether you’re picking up red marks, or going out to a job site to observe how designs translate in the field, ask questions from the experts around you to better understand the reasoning behind the decisions that were made, so you will then be able to apply the best solution when you find yourself in a similar situation on a different project. However, more important than developing your technical knowledge, understand the “why” as it relates to why you do what you do every day. At the end of the day, what truly motivates you? Understanding this “why” will give you an intention and deeper purpose, and will motivate you to do the very best you can every day. TZL: Back in 2011, when you first entered the AEC industry, what was your biggest challenge and how did you overcome it? MA: Like many interns, I had to learn how to relate to real-world challenges. In our profession, no two projects are identical, so I had to learn how to apply those foundational concepts and problem-solving skills to each individual situation, and to convey those solutions in a set of documents that could actually be used in construction. The satisfaction of solving these problems was similar to college; only this time, instead of a letter grade, the reward was a building; better than an individual accomplishment, it was a positive impact on a community. TZL: On the other hand, what was easier than you thought it would be? MA: The transition from classmates to co-workers was easier than expected. In college, we worked together to make it through one of the most rigorous majors we could have chosen. Entering the industry, I was pleased to find the same collaborative mentality, with everyone coming together to solve exceedingly difficult problems, and come up with the best solutions possible. I wasn’t treated as an intern or rookie, but rather as a valued member of the team. My peers and leaders respected my perspective and supported me in the transition to the industry. TZL: What do today’s CEOs and firm leaders need to know about the younger generation? MA: In my experience with my peers, I think our generation wants to be a part of something bigger than ourselves. We want to ensure that what we do every day, including our careers, has a positive effect on our world. Through our projects, we want to create solutions that are meaningful, conscious of their environmental impact, and will make communities better for the current and future generations. Beyond our professional work, I think many of us also like to be hands-on in making an impact, and gravitate toward a company that shares this desire. TZL: What is the biggest mistake you’ve made and what was the lesson learned? MA: In general, one of my biggest mistakes has been a lack of confidence. I’ve always had nothing but the greatest support system my entire life. Yet, when I jumped into my career, or even my first quarter in graduate school, I was intimidated. You feel as though you are surrounded by geniuses who know everything and it can be hard to think that you can ever reach their level of expertise and understanding. The learning curve is so steep when we enter our careers and we know we don’t have all the answers. However, recognizing that lack of confidence was only going to hinder my potential and keep me from reaching all that I could become has made me work even harder to improve. I’ve found solace in recognizing that this industry is ever-changing, that we will always be learning, and that I’m also surrounded by selfless experts eager to share their knowledge and mentor me along this journey. TZL: There’s an increasing interest in the business side of the AEC business. Do you think the college curriculum could use a few non-technical courses? If so, what are your recommendations? MA: I think it is very important for everyone to understand the basics of business and how a firm operates as a whole. The more the individuals in a firm understand how we each play a role in the overall success of a business, the more capable we are in helping the firm run effectively. At my first internship, I was fortunate enough to gain some experience in the financial aspects of the company, assisting with payroll, billings, and taxes, among other office management duties. This exposure stoked my interested in business and led me to enroll in an accounting course during graduate school, which introduced me to assets, liabilities, and the many other considerations of operating a business. In my current position, these principles have helped me manage projects and understand the associated financials. I certainly don’t claim to be a business expert (far from it), but I hope to continue my growth in this area, as I realize how crucial it is to the financial health of individual projects and the company as a whole. In addition to business courses, other valuable courses would introduce students to soft skills, like communication, leadership, and project-solving skills. The AEC industry, like many others, is based on much more than technical abilities. The more you can supplement your technical knowledge with business savvy and soft skills, the better. TZL: You received TETER’s 2018 Be Inspirational award for your work ethic and ability to finish a project. Describe being honored by your peers and how the celebration fits into the company’s culture. TZL: Volunteering at an animal shelter. Mentoring high school students. Youth soccer and summer camp. What drives the philanthropic side of your life? MA: I know I wouldn’t be in the position I am today without the mentorship and encouragement I received from my parents, friends, co-workers, professors, and coaches who took the time to help me grow, and who continue to help me today. I am incredibly grateful for those who have invested in me, and I want to do all I can to pass that along. Plus, many of the activities simply bring great joy to my life. Soccer is and always has been one of my greatest passions, and I treasure any chance I get to share the love of the game with the next generation. I get to watch them build that camaraderie, learn the life lessons that come with playing sports, and develop relationships that may last a lifetime. Mentoring high school students is also very rewarding, as I’ve always enjoyed school and learning, and now get to contribute to helping these students grow their passion. Ultimately, I want to make the world, or at least someone’s world, better in whatever time I’m given. I want to serve, love, and encourage as many people (or adorable animals) as I can. TZL: TETER has crossed the 100-employee threshold and recently opened new offices in Modesto and San Luis Obispo. How has growth affected you specifically and the firm in general? MA: Growth presents more opportunities for staff, including myself, to stretch ourselves and take on new roles. It also allows for more in-house development opportunities, like mentorship and training, which betters both our employees and our firm. TZL: It seems like you have developed a specialty working on projects for public clients. What are the pros and cons of doing design work for public owners? MA: My favorite part of working on public projects is the opportunity to serve the educators, students, and communities who will benefit from the work we do. Some of my childhood friends now work at the schools we’ve designed, or have children who attend them. In my experience, the public owners, whether school superintendents or government officials, have the same passion for serving their communities and providing them with the best facilities possible. They have great pride in their projects, and being able to help them make their dreams become reality is extremely rewarding. TZL: What drove your decision to become an engineer in the first place? Was there ever a different career you wanted to pursue? MA: Being an animal lover since I was a child, my heart was set on becoming a veterinarian, until I realized I’d have to face the reality of not being able to save every animal. Although soccer was a huge part of my youth, I think the practical side of me recognized that I was probably not going to have a lifelong career on the pitch. I loved art, but was also partial to the challenges presented in my math and science courses. Architecture seemed to be a perfect balance of my regard for both the left and right brain activities. However, I also had a mentor from an early age who is still the most passionate structural engineer I’ve ever met. He guided me through science fair projects about coefficients of friction and the thermal properties of wood, took me along on job sites, and most importantly, believed that I could become an engineer in a male-dominated field. His passion, along with my parents’ constant encouragement and support of whatever I chose to do in life, helped lead me to engineering. TZL: What’s the most important thing you’ve ever learned from a mentor? MA: While I have many great mentors in the industry who help me with everything from technical knowledge to work-place confidence, my greatest mentors have been my parents. They’ve taught me to believe in myself like they do, and have led by example in their own careers and in their roles as parents and life mentors. At a young age, I learned from them that there were two things I could always control – my attitude and my effort. This advice guides me in my profession and in all other aspects of my life.